The two sides are still talking and we fans are still hoping – for that big, all the marbles heavyweight unification showdown between Anthony Joshua and Deontay Wilder. And while at a sportsman’s dinner over the weekend, Joshua, the reigning WBA/IBF/WBO heavyweight king, explained why he is determined to have the big fight take place in the UK – the location and venue of the fight apparently being one of the major sticking points in the negotiations. 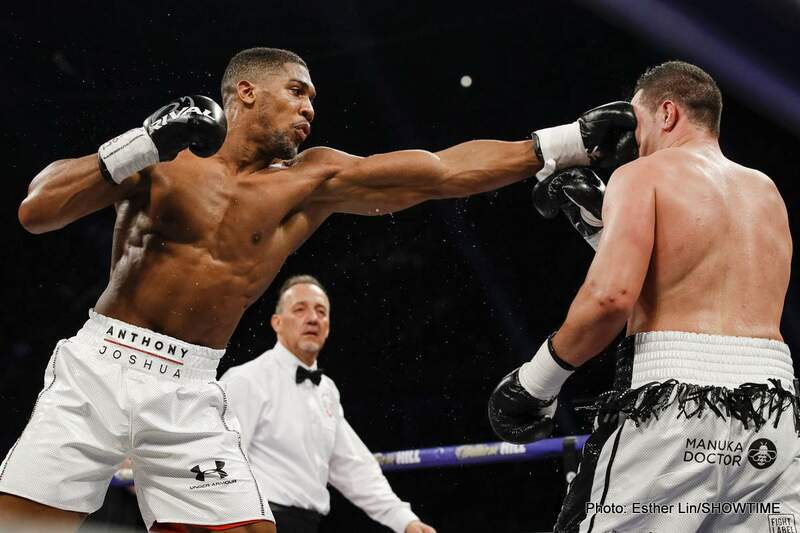 One one hand, AJ wants the fight at home because he feels he “owes it” to his loyal UK fans, but on the other, Joshua is wary of the “the tricks that they play in terms of referees and judges” in the US. Joshua is concerned about the possibility of being robbed it seems – even though most fans feel there isn’t much chance of this fight going all 12-rounds and going to the three score-cards. Recently, Joshua has said he is almost 100 percent sure the fight will happen and next, and he is also sure of another thing: the fight will be brutal when it does go down. Wilder has similar ideas and he too is looking forward to beating up his rival and doing so in a hugely dominant fashion. All we need now are the two signatures on the fight contract. But will this fight actually take place, and this year? Again, we’re all hoping.